Sen. Rand Paul (R., Ky.) suffered five fractured ribs and lung contusions after he was attacked at his Bowling Green home on Friday. The injuries came after Rene Boucher, a neighbor of Paul's, tackled Paul from behind, Politico reports. Paul's chief political strategist Doug Stafford released a statement on Sunday with Paul's condition. 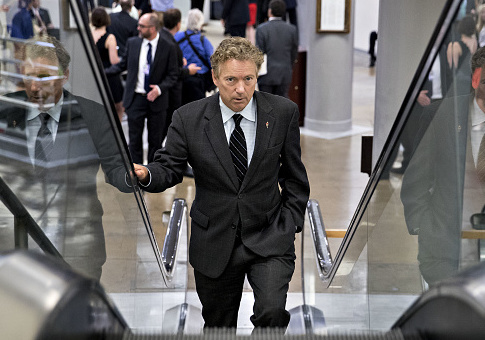 "Senator Paul has five rib fractures including three displaced fractures," Stafford said. "This type of injury is caused by high velocity severe force. It is not clear exactly how soon he will return to work, as the pain is considerable as is the difficulty in getting around, including flying." Stafford also said that the injuries Paul suffered could lead to additional and more serious problems. "Displaced rib fractures can lead to life-threatening injuries such as: hemopneumothorax, pneumothorax, pneumonia, internal bleeding, laceration of internal organs and lung contusions. Senator Paul does have lung contusions currently," Stafford said. "This type of injury is also accompanied by severe pain that can last weeks to months." After the attack, Paul bled from cuts around his mouth and had difficulty breathing. Boucher has been charged with Fourth-Degree Assault, a misdemeanor which could result in a year imprisonment. Officials have not given a motive for the attack. The attack comes less than five months after Republican members of Congress were shot at on a baseball field in Alexandria, Virginia, seriously wounding House Majority Whip Rep. Steve Scalise (R., La.) and injuring four others. The shooter, who was killed by police, was a far-left supporter of Sen. Bernie Sanders (I., Vt.). Paul was present at the June shooting. Paul tweeted Sunday evening he appreciated the support after the "unfortunate event." This entry was posted in Politics and tagged Congress, Rand Paul, Senate. Bookmark the permalink.